I just took a chance to see if you had come to this blog yet and you did! ohhhhhhhhh Cheryl, I have used tea tree oil also! It works! 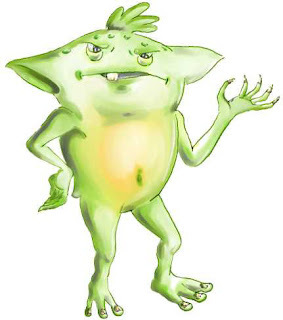 Had the fungus on my big toe nails. I just applied it with the brush daily a few times and it works!!!! So injecting it will be even better I think.They sell it at the beauty supply house I go to, and it sure stinks but does the trick. Only thing is it takes some time to work so just keep doing it. I haven't used it for a very long time and I need to start again as they are getting thick again. Right now just trying to stay warm! Have a good day and I love ya lots! So! We are on the same wavelength with the nail fungus also? Funny thing. Imagine sharing a common bond such as nail fungus. 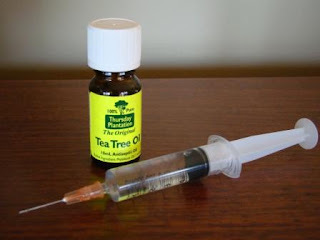 It is possible that your bottle of Tea Tree Oil comes from Australia also. The good news with the syringe is that I do not actually have to inject it into the skin. Placing it sideways under the nail apparently allows it to go into the nail bed which will take care of the fungus at the root cause. I do know that it is a difficult thing to get rid of. My friend, I am, thankfully, feeling more like my old self and looking forward to many hours of writing. I will keep a careful eye on this arm as I really do not want to find myself in the same position. Think it is definitely time to go back to my old brand of notebook computer and move back into the office. Had not had this problem previously. Fungus in nails...that sounds grim. Hope the Tee tree oil works, it is magic stuff I use it for a variety of things but never thought to use it on a skin fungus that I have. Must try it. Take care. Feel blessed that you have not had the wretched thing in your nails. It is quite difficult to kill off.. I love Tea Tree Oil. Being one to test the more natural remedies before visiting the pharmacy I find it brilliant for lots of things. Do hope you are surviving the holiday period! Seems to have been 'full on' for you..
Take care and lots of lovely sightseeing. Enjoy your pics..
Thankfully Mandy we seem to be over the head lice although Haydn's daughter Alex has had them through her household several times recently. I am looking forward to getting back to running the two blogs. I find the writing very therapeutic..
Big hug to you LOL Do hope Matt is doing OK. Does he have dates for treatment?